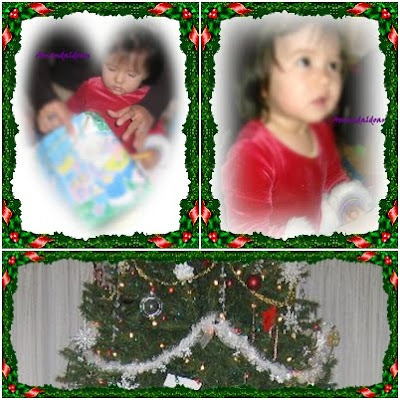 Home » family » Holidays » Trinity » Ruby Tuesday: Can't Wait til Christmas! Ruby Tuesday: Can't Wait til Christmas! Found baby under the Christmas tree checking out her gifts. She doesn't understand the waiting concept, nor how Santa is supposed to visit us when we all are in bed sleeping. But she does know that presents are meant to be opened, so she just can't wait. Thanks for your visit. Please leave me a comment so that I know you've stopped by. Adorable! I love that outfit she was wearing. Merry Christmas! Cute! The little ones enjoy Christmas so much, it is a pleasure to see them. I wish I could see her in person! She is growing so fast..Love you guys! Aw, she is so cute. 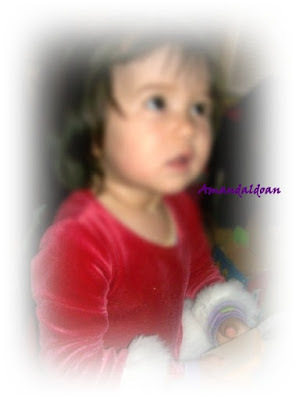 She looks adorable in the pretty little red dress. Your daughter is so sweet. I hope she had a fun Christmas Day. Thanks for stopping by for Ruby Tuesday.